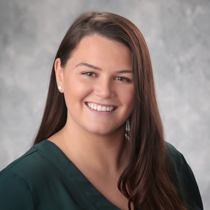 Emily Filley | Quality Production, Inc.
Emily graduated from SUNY Cortland in 2015 with a Bachelors of Arts in Communications with a concentration on Public Relations and Advertising. She spent the last three years working in digital marketing and advertising with local print and digital publications before making the move to Watertown, NY and becoming Digital Marketing Coordinator at WPBS-DT. When she isn’t at work, Emily loves going fishing with her husband and playing fetch with their dog.